The highly modernised Ultrasonography Division at Fernandez Hospital was set up in 1985. Today, we handle an average of 65 scans per day, using the latest equipment, including the Voluson Expert. Since scanning is performed by a team of Fetal Medicine Specialists obstetricians and gynaecologists, critical decisions are made with minimum loss of time. 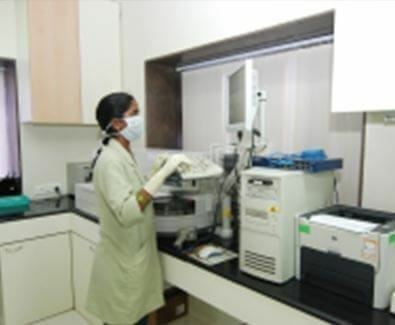 The medical diagnostic laboratory at Fernandez Hospital offers a full range of services round the clock. The lab conducts more than 300 tests daily and is equipped to carry out routine, as well as special investigations. Our high-end technology is put to the test during medical emergencies, where time is a critical factor. Accurate and reproducible results are then flashed through the LAN for easy access by doctors. Quality control and quality assurance are strictly implemented and authenticated. Regular internal and external quality control checks, are conducted both at national and international levels. The laboratory is actively involved in the infection control activities of the hospital. In addition it provides pathology training to nurses and paramedical students. Quality checks of the equipment are run daily, using internationally accepted methods and standards (EQAS).